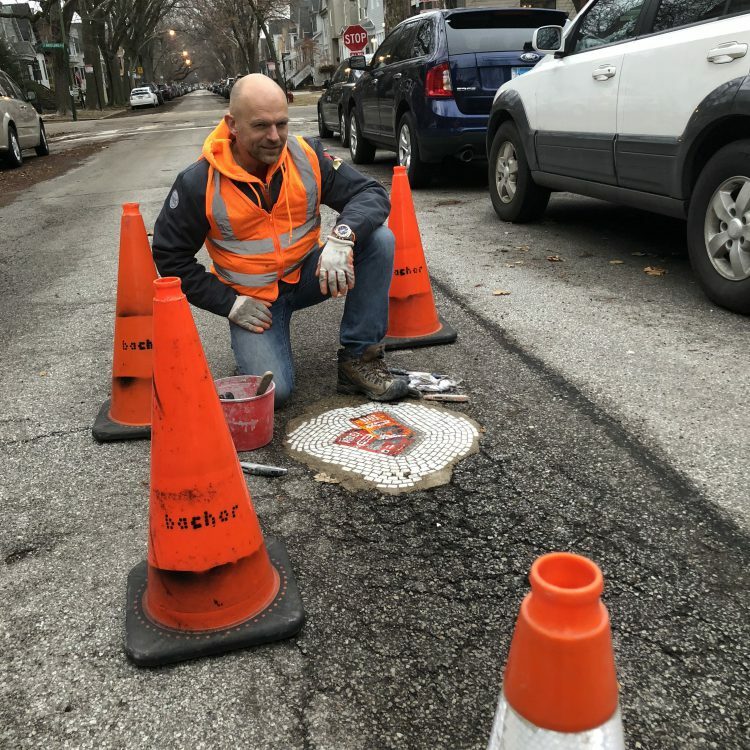 Chicago has all types of street artists, but perhaps the most widely known active street artist is Jim Bachor, who is also a safe bet as the only artist fulfilling a public need with his work — pothole repair. Originally from Michigan, Bachor, 54, has lived in Chicago since 1987. 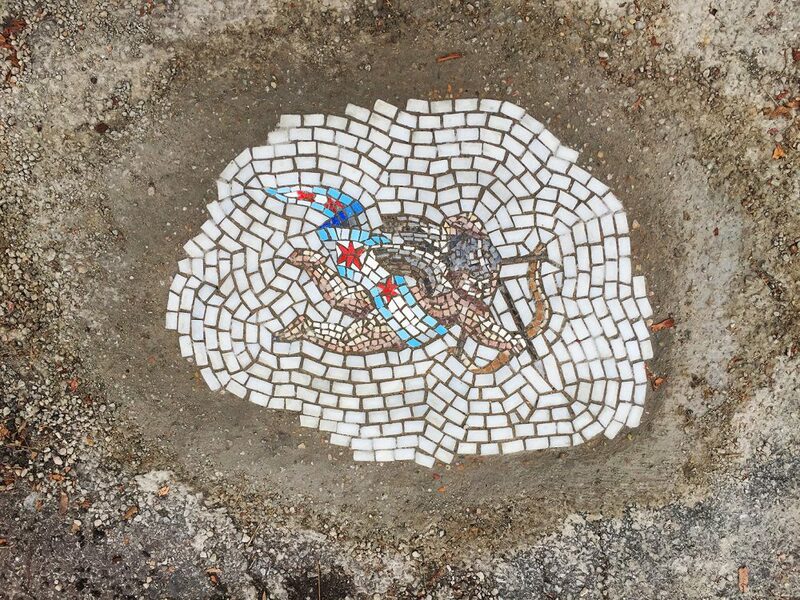 He currently lives in the Northwest Side’s Mayfair neighborhood with his wife and twin 12-year-old boys, the same location that he first did what has made him into an art celebrity, filling in potholes with mosaics. Bachor moved to Chicago after studying graphic design in college because he didn’t want to be stuck designing for the auto industry in Detroit. He worked in design and advertising in Chicago for more than two decades and during that time discovered the art form of mosaics on the trip to Italy. He would fall in love with the art form and learn the ancient way the artists did it, but did it as a hobby until being laid off from his regular job. It was then that he decided to work full-time as an artist. He created mosaics for art collectors and often did commissioned work, winning several awards along the way. But it would be the pothole art that got him the most attention. 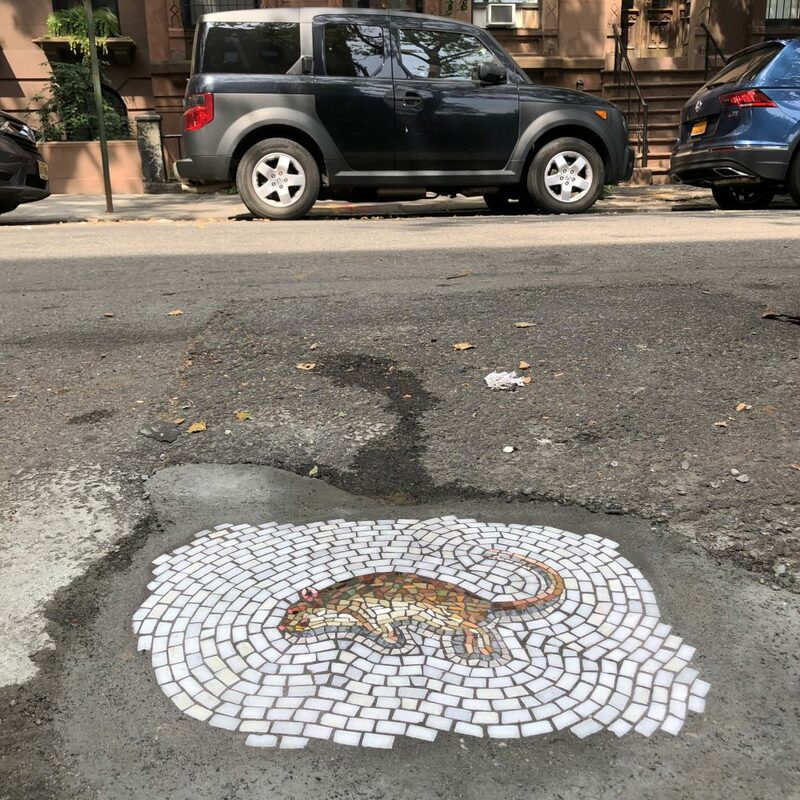 Beginning by chance, Bachor has now taken his pothole art to several cities, most recently New York, where last month his work wasn’t received as warmly as in Chicago. Bachor recently talked about that, as well has how it all began, with Bob Chiarito of The Chicago Ambassador. CA) When did this start for you? BACHOR) It really started in the late 1990s when I went to Europe for the first time. CA) You fell in love with mosaics when you went to Pompeii? BACHOR) Yes, that’s what started it all. I was already working in a creative field, so I was predisposed to it. I fell in love with ancient history and really got “dorkified” about it. I started traveling by myself to Greece and Turkey and back to Italy, exploring ruins and reading a lot. In doing that, you read about ancient art forms and the ones that still exist today are the durable ones. The durable ones are the mosaics and the sculptures, but it was the mosaics that really turned me on. In Pompeii, there was a tour guide that I’ll never forget who pointed at a mosaic and said, ‘The marble and glass do not fade, and it’s set into mortar.’ So, essentially the art is the same as the artist intended almost 2,000 years ago. It was that staying power that blew me away. About 9 months later, I flew back to Italy to take a course on how to do it the ancient way. I pursued it as a hobby for years but then when I got laid off my wife’s career took off and gave me a safety net to go in headfirst with my art. CA) You’ve done a lot of commissioned mosaics, and some for the city and have won a lot of awards. When did the pothole thing start? BACHOR) I had been doing mosaics for quite a long time and they are very tedious. I tried to have multiple projects going on at the same time so that I could stop one and work on a different one just to clear my head. Flashback to May of 2013, the potholes were really bad in my area of Chicago. There was one in front of our house that was a stubborn one that refused to stay fixed. The city would put asphalt in it and it would pop back out. It just dawned on me over time that I had this passion for this art form that is so durable and permanent, and I had this hole in front of my house that refused to stay fixed. 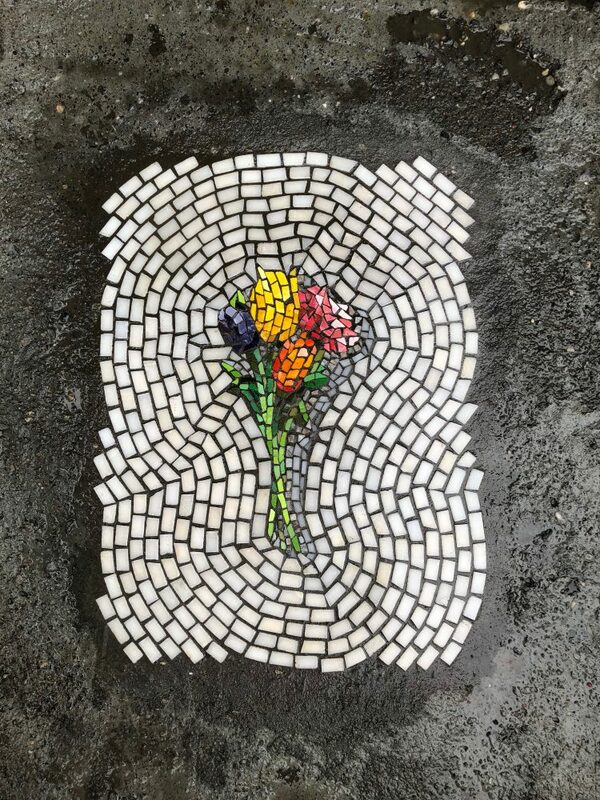 So, what I did was I created a custom piece of art for that pothole. That first one just says “Pothole.” It took me about a half a dozen before I knew how to do them right, protecting them until they set and things like that. I started using my boys’ little soccer cones to put around them but now I have serious 24-inch traffic cones. 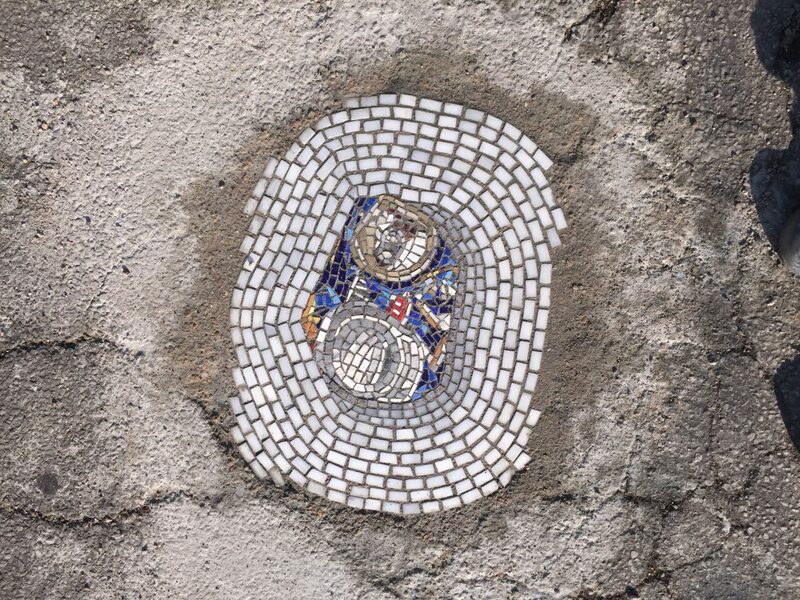 CA) It’s interesting that you talk about the permanence of the mosaics yet you’re taking a risk that the city will rip up these potholes, or even the cars over time. BACHOR) There definitely is a juxtaposition there that’s interesting. They last forever, however it’s more about the street than the art. I have pieces that are pushing three years old because the asphalt has sustained. It’s all about the stability of the asphalt. CA) Did you ever get any flak from the city? BACHOR) No flak. The only indirect communication I had with the city is when the Chicago Tribune did an article on me. The reporter called the city for a response and they said they appreciated the spirit of the campaign but that I should leave the work to the professionals. But that’s been it. CA) Before that, did you consider doing them anonymously? CA) When I first came across you, it reminded me of the Toynbee Tile thing. BACHOR) Yeah. I didn’t know about that until I started doing this. Someone said that to me, so I looked it up. They made a documentary about it that I must watch. What I love about it is that the person has a car with no floorboard, so he could pull up to the spot and sit there and do it. That’ s the thing, with my work, I can’t be incognito. It’s not like Space Invader or Banksy who can come and go in 20 minutes. CA) How long does it take? BACHOR) It’s a two-step process. The first step takes about an hour-and-a -half to install it, to put the art in. Then I protect it with traffic cones or maybe a tarp depending on the weather. Then I come back 8-10 hours later once the concrete is hard to do a final scrub with metal brushes and take photos of it to document it because that’s the best it’s ever going to look. I can’t do it any faster than that. CA) How do you decide where you do them? BACHOR) It started out in my neighborhood along the route I normally drove throughout a day. Then as I got a little more press I started to spread it out around town, but it’s something that I still struggle with to this day. Because the further away they are from my studio, the longer they take. The other thing is, in nice neighborhoods the potholes get fixed really quick so I can’t do it there. I have a map of them on my website, so I’ll look and see a dead-spot and try to get one there. CA) Do you pick a neighborhood and then search for a pothole? BACHOR) What I do, my other big job is that I’m a stay at home dad, so I must be really efficient with my time. What I try to do is put something on Internet saying that I’m looking for candidate locations, maybe on the South Side. Once in a while, I get someone who really gets into it. I had a student from the University of Chicago email me with a PDF, photos, sizes and maps of four candidates. That’s what I need because then I could swoop in and do it. CA) What about the materials? Is it all paid for by yourself? BACHOR) It started out that way, but I’ve done Kickstarter campaigns for the last few years. The pieces cost about $100 for the materials per piece. This year I did my fourth Kickstarter campaign and one specifically for a New York trip that I wanted to do. CA) You were just there doing your work. How many pothole pieces did you do? BACHOR) I did eight. Five were funded by the Kickstarter and then a company paid me to do three others. CA) Did you have to incorporate their logo? BACHOR) No, I said I wouldn’t do that. They were really cool about it. CA) What was up with the folks in New York? BACHOR) If I had to do it over I know what I’d do differently. I never had to deal with a city being so aggressive with the work. Essentially, I got all five of the Kickstarter pieces done and the New York Post got in touch with me. The reporter asked me what was going on and I told her, but I also told her exactly where all the pieces were. The story ran the next day with a list of locations. She contacted the city’s department of transportation and they said they were not happy. They said it was going to distract drivers and that they were going to remove them. I wasn’t sure if it was bluster or not, but by the time I was in the airport to head home, they were pulling them up. They were all up by the time I got back to Chicago. The thing that blows me away was the effort to remove them. I’m not sure if they used jackhammers but the concrete was set, so they were not easy to get out. The best part of the story was an email that I received from the department of transportation asking if I’d be interested in an art collaboration. Maybe it will be nothing but maybe it’s an olive branch. Obviously, I can’t say they were wrong for removing them, I have no leg to stand on. But, they came down pretty hard for what it was. CA) You’ve never been arrested for it, have you? BACHOR) No. I’ve had about eight interactions with the police, mostly in Chicago. Once they know what I’m doing they are cool about it. When I was doing one near the University of Chicago, I’m working and I’m not trying to draw attention to myself. This was the one that the student emailed me about. So, we had the cones out and he was kind of laying on the ground. I’m working, and I sensed the heat of a car pulling up next to me. I saw the blue stripe and asked him if it was a cop. So, the officer gets out and I’m on my hands and knees working. He looked at me and asked if I was that pothole guy. I said yes, and he’s was like, “That’s so freaking cool.” He loved it. CA) I just saw these commercials about Domino’s Pizza filling in potholes. Are they trying to thread on your turf? BACHOR) I would assume my work was part of the agency’s pitch to them when they were pitching the idea. But, it’s the public way, I can’t claim too much ownership to it. CA) Does it matter if it’s a busy street or a side street? Obviously side streets are probably easier to do an install on, right? BACHOR) Yes. But it must be visible, not so much to cars, but to people walking by. CA) As far as the images, are they what come to mind? BACHOR) A lot of time I do a series and the series have an idea behind them. Sometimes I do one-offs. Several of the series have what I call universal truths. Everyone hates potholes, no matter who you are. I’ve gotten emails from all over the world because everyone can relate. So, one of my series was on things that pretty much everybody loves. I loved the juxtaposition. Things like vintage ice creams or flowers. It was that total contrast of things. You’re walking down the street and you certainly aren’t expecting a piece of art. CA) You’ve gotten a little political lately with your “Liar” mosaic near Trump Tower Chicago. BACHOR) Yeah, that was real interesting. I just wondered what I can do if my boys ever ask, ‘Did you do anything during that time?’ So, I did the Liar piece with the Russian flag as close as I could get from Trump Tower. CA) What other cities have you done them in? BACHOR) Because cost is always an issue, I try to bring a piece of art on pre-existing trips. I won an award in San Antonio, so I brought a piece out there. I spoke in Los Angeles a couple years ago, so I brought one out there. I did a series last August in Nashville; a gallery in Finland had me come out there for a week in 2015. CA) Did you get the materials out there? BACHOR) All the art, the mosaics, are done beforehand. Those take 8-10 hours to do so they can’t be done on the street. It’s all held together with cheese cloth, so I fill the pothole with concrete and mortar, put water on it, and install the mosaic. CA) So on the recent trip to New York, you brought the mosaic’s out with you? BACHOR) I was really smart and used Fedex instead of bringing them on the plane, which gets expensive. CA) What about the concrete? BACHOR) I bought that out there. CA) Did you have the spots picked out before you got there? BACHOR) Yes, I hired a local pothole scout. [Laughter] It’s critical because I have all these Kickstarter backers that I can’t disappoint. I need to make sure it works. So, a filmmaker contacted me to ask me if she could do a short film and I said sure. I told her that I was looking for a pothole scout and she knew someone. The guy was great. I told him that I wanted to do eight and would need about 16 locations. Cars block them or park on them so sometimes you can’t do them, which is why I need more than the amount I’m actually doing. CA) Were they all in Manhattan? 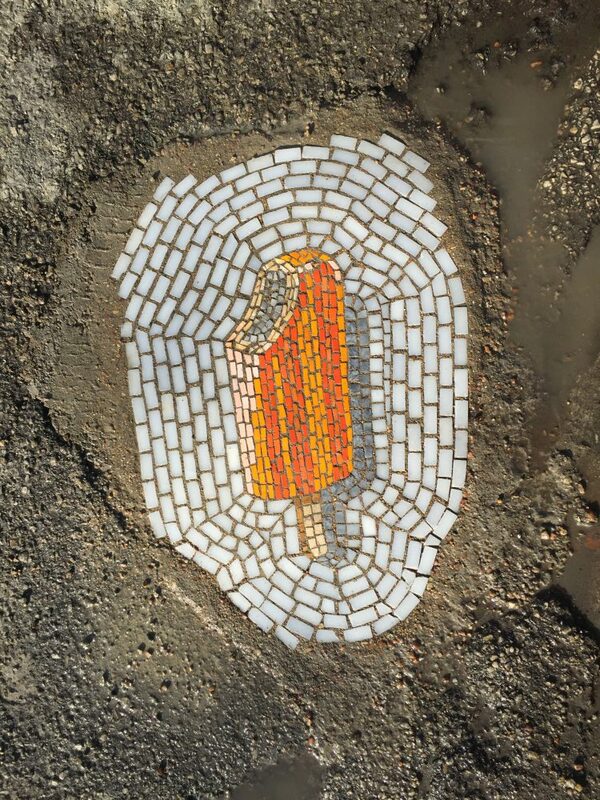 CA) Are you still doing the non-pothole mosaics? BACHOR) The pothole thing has kind of taken over. I can’t complain about it because I’m in a good place as an artist, but I don’t have any time for other art. BACHOR) I’m Starting to get invited to these mural festivals. I was invited to Detroit in September and plan to do ten there. CA) What does your wife think of this? BACHOR) I don’t know. I think she’s shaking her head because she’s been along for this ride and I don’t know where this ride is going. I want to ask someone what I should be doing next but there’s no guidebook. I keep doing what I’m doing, and good things are happening. It seems to be working out. I just got an email from someone at a record company talking about doing some guerrilla promotion. Crazy stuff that I never imagined in a million years. CA) It’s kinda interesting that you don’t really know what’s next. BACHOR) I don’t. I have a couple projects, but nothing has been confirmed. The Detroit trip has been confirmed. There may be something with the New York department of transportation, there may be something with a record company. I’m supposed to have a big project in Italy in the spring of next year that will require a month-long stay with a bunch of installs and a gallery show. 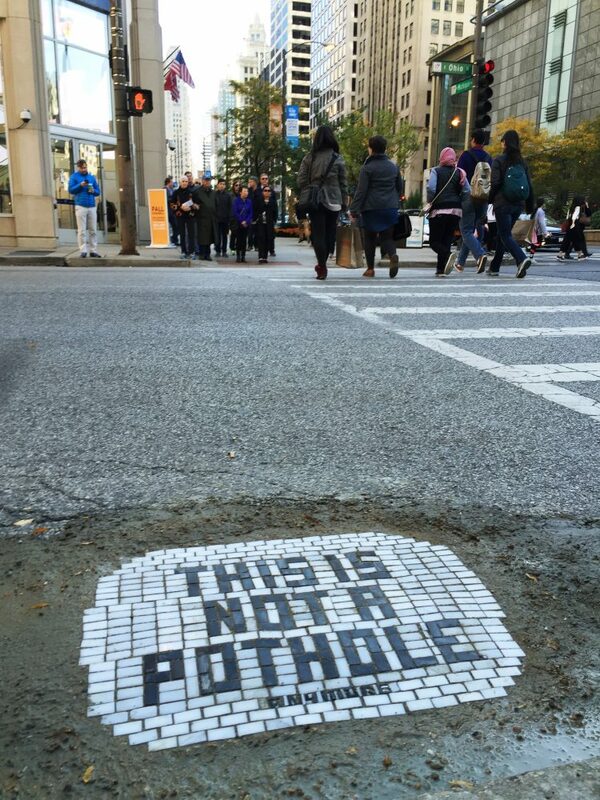 For more information and a map of Jim Bachor’s pothole installations, click here.